The 4WD was spitting gravel like hailstones, and leaving an enormous cloud of dust in our wake. With the state of this road, none of us wanted to risk driving at night. Jeff suggested we pull over, jump a fence and pitch our tents. As adventurous as it sounded, I objected, because we didn’t know what would be out there. We began to consider stopping at a farm, and asking the owners’ for permission to camp. The horizon swallowed the sun. Time was up. The farm plan it was. We pulled over into the next driveway. We let ourselves through the gate, arriving in front of a large, pretty farmhouse on a large property. We knocked on the door. No answer. We attracted a Jack Russell terrier, who followed us dutifully. Nearby, a few Namibian women were hanging laundry at a group of smaller houses. With his friendliest voice, Wessel spoke with them in Afrikaans, learning that they were the farmhands. Just as they explained that the owner was out, a truck rattled down the driveway, and stopped alongside us. An unsmiling blonde woman leaned out the window and offered a skeptical greeting, before turning to the staff to ask who these strangers were. Wessel took the lead, and exchanged introductions in Afrikaans. The woman was named Tina, and warmed up to our presence when we explained our need for a campsite. She was, in fact, very friendly, and gave us good advice for avoiding animals on the roads in Botswana. She disappeared into her house for a moment, before returning with a key. She had a chalet for us. Wow, a chalet! We insisted that a nice comfortable piece of grass for our tents was enough for us. She said it was no problem, and that guests infrequently came to the farm, so we followed Tina up to the pointed, thatch-roofed chalet. Just outside, she stopped by a 4-meter high fence. “Let me introduce you to Tsabu“, Tina announced with a wry smile. We assumed it was the Jack Russell was running around our feet and challenging the fence with aggressive barking. 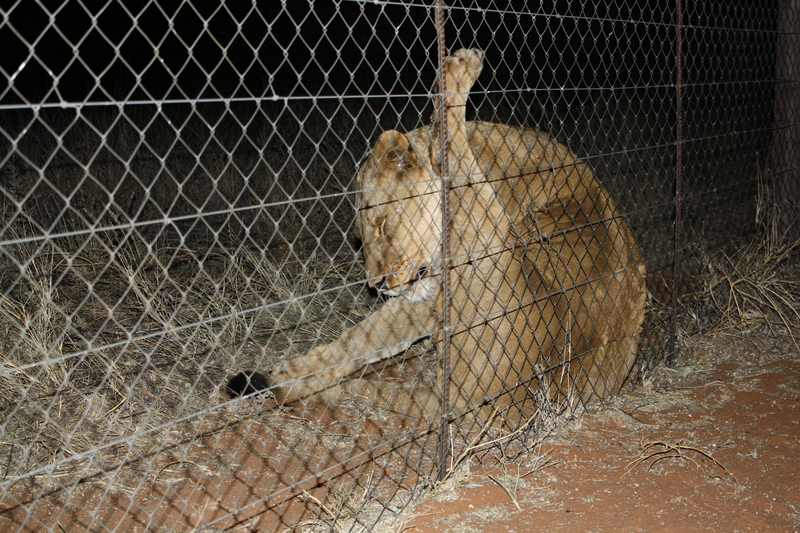 Then, bounding out of the darkness came an enormous male lion, leaping against the fence with it’s massive weight, two great paws gripping the metal as the fence reverberated with the force. The fence held in place but the three of us were speechless, stunned. 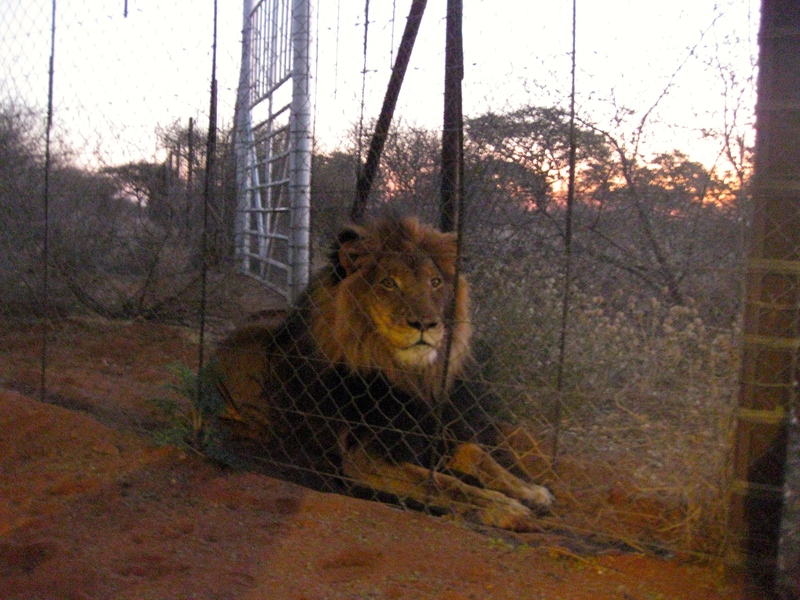 We’d just felt what it was like to have been charged by a lion. “This is Tsabu!” Tina proudly exclaimed, as the Jack Russell still barked bravely through the fence. She explained that he had been saved by poachers. Tsabu stood on guard, staring at us with dark, intense eyes. He was a beautiful animal. In the adjacent enclosure lived two female lions, which Tina assured us were tame enough to pat. 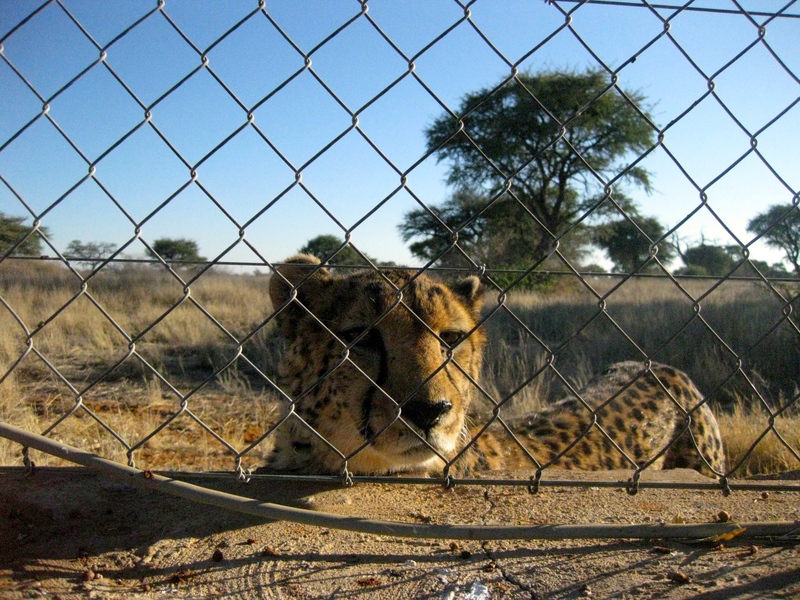 They both came up to their fence and inspected us, far less aggressively than Tsabu. Tina showed us the inside of the chalet, with three single beds, a small kitchenette and dining table, with walled-off bathroom and shower nooks. The barbecue pit was just outside the door. Tina bid us good night. 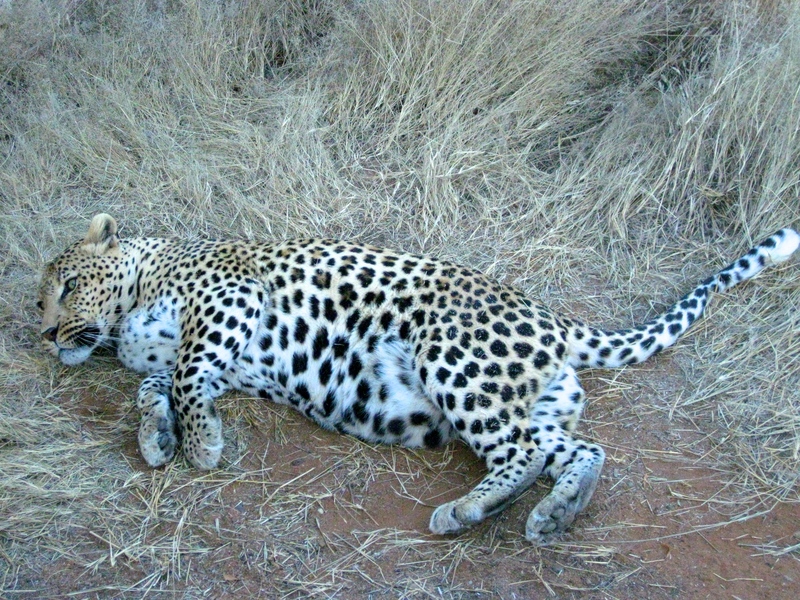 We waited until she was just out of sight before excitedly discussing with disbelief about what had just happened; our free chalet, our lion neighbours (which were still staring at us), and a chance to see even more of Africa’s most dangerous big cats. This was only night two of our road trip! 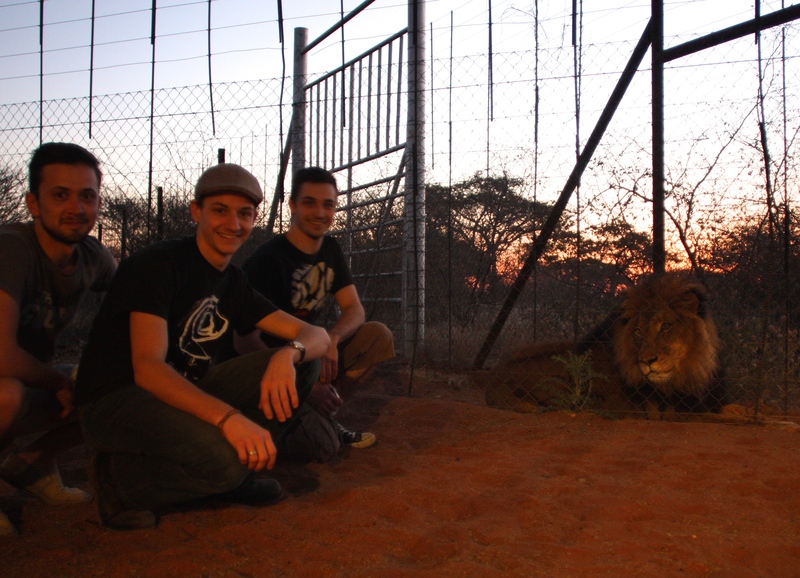 All we could think about were the lions, and we wanted to look at them, take photos of them, and try and pat the females. Tsabu was pacing, as curious about us as we were of him. The females were lying against the fence, relaxing, and already used to our presence. We stroked their fur, which felt hard and wiry. 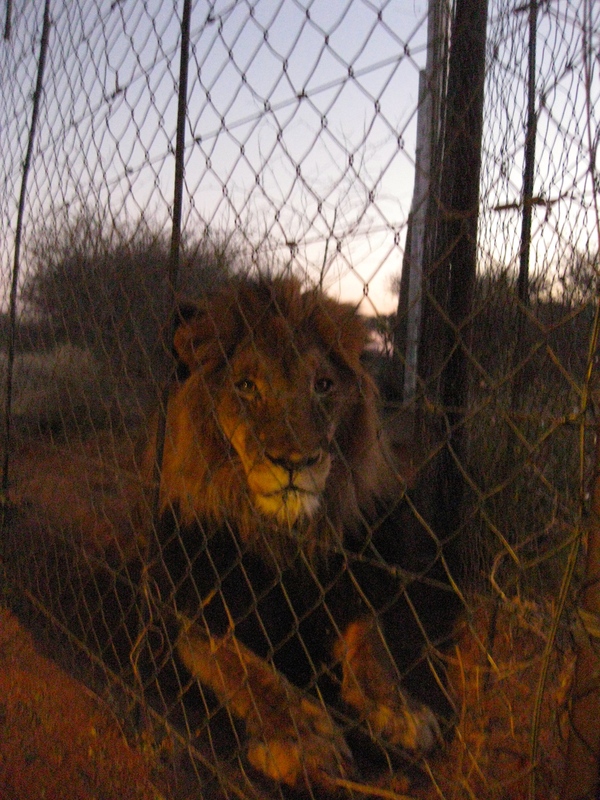 We weren’t going anywhere near Tsabu, who straightened up and stared at us whenever we got near him. He had a majestic face, and was in top physical shape, a ball of muscle with teeth. I’m happy we didn’t jump a fence to camp. 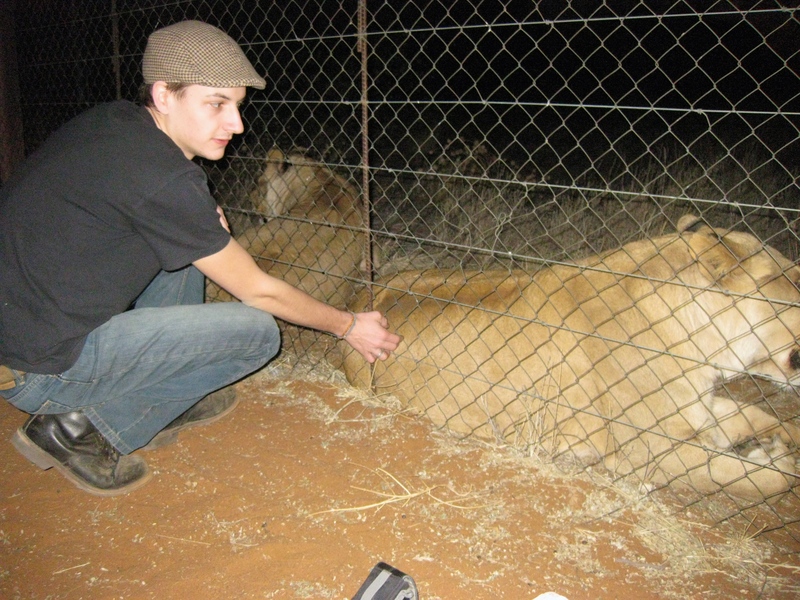 As Jeff and Wessel went to the car to collect the sausages, gin and tonics, I decided that I wanted to try and pat one of the female lions on the head. I put my hand near the fence to stroke it and it suddenly turned, looking at me. I fell backwards in surprise and landed into a spiny bush. I tried to pull myself off but the thorns were as sharp and barbed as fishing hooks. My skin was pierced and ensnared, as were my clothes. I called out for help, completely stuck. Jeff and Wessel walked over to find me awkwardly attached to the bush. “The thorns are in my clothes, in my skin, I can’t move my arms to pull them out!” I complained, and the boys got to work freeing me. I was covered in tiny blood spots on my arms. I had learned a lesson about African plant defence the hard way. We put some sausages on the barbecue, and as we cooked them, Tsabu watched our every move. 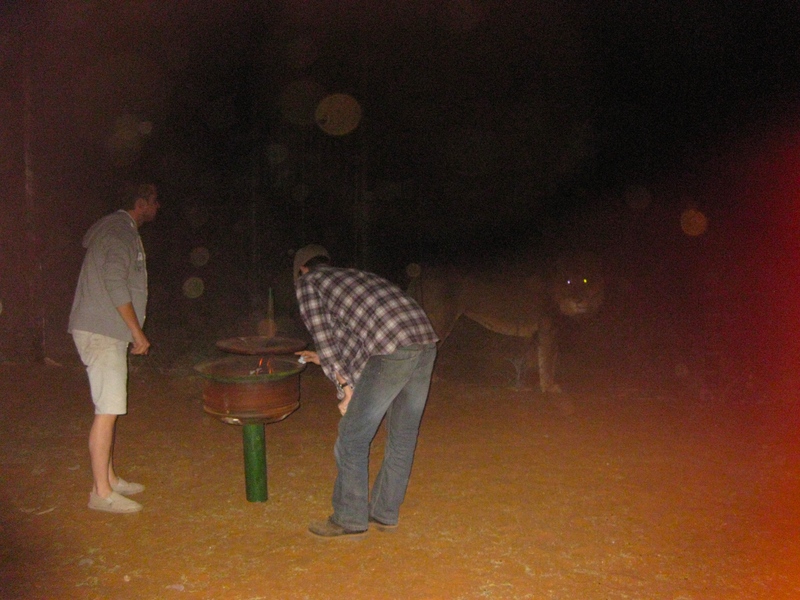 We were having a barbecue with a fully grown male lion just three meters away. The absurdity of the situation made me laugh with disbelief. 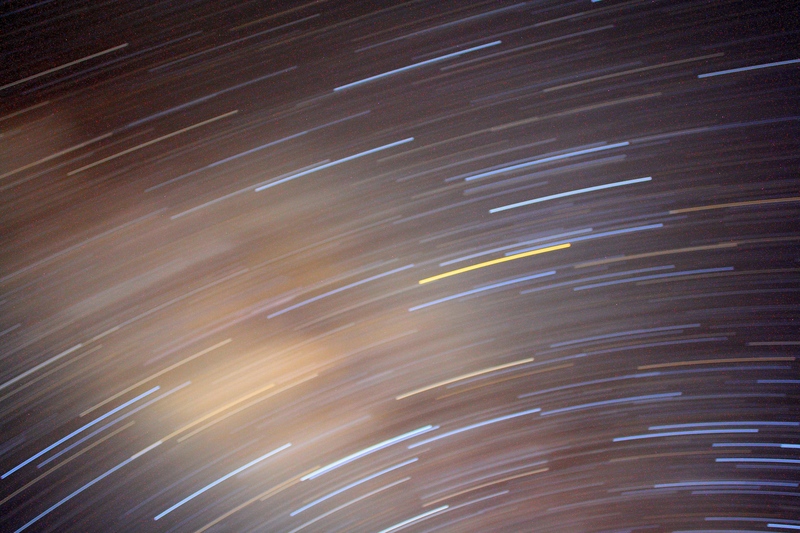 Jeff and Wessel were setting up a camera with remote shutter to point to the stars for a long exposure. The resultant photo showed the stars arcing through the sky, the rotation of the earth dragging spots of light into elegant silver arcs. We stayed up drinking gin and tonics, before the fatigue of a day’s driving put us to bed early. The next morning was heavy with the sound of insect chirping. And the day was already rather hot. We woke up and visited Tina at the farmhouse. She was excited to show us her other big cats. The first was a large enclosure, a wide open plain stretching out of view. It housed eight cheetah. Seven were roaming around somewhere out of view, but one (which was tame enough to pat), walked right up to the fence. 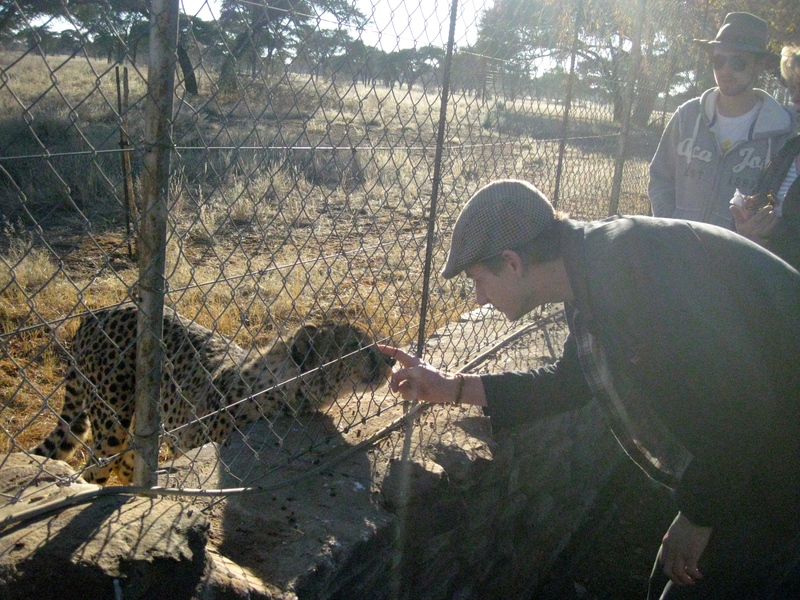 We pat the cheetah on the head and it enjoyed the attention, simulataneously docile and alert. This was a gorgeous cat, sleek and predatory, black markings running down from it’s eyes giving this fierce feline a sense of sadness. Aquila the leopard was in the next smaller enclosure, with more trees in which to climb and hide. It too was tame, and walked up to the fence, posing and strutting for it’s audience, before falling to the ground and rolling on the grass like a household cat. It lay on it’s back playfully, as if it wanted a belly scratch. It was fat, probably one of the perks of captivity. We thanked Tina for her generous hospitality and re-packed the car, ready to go. 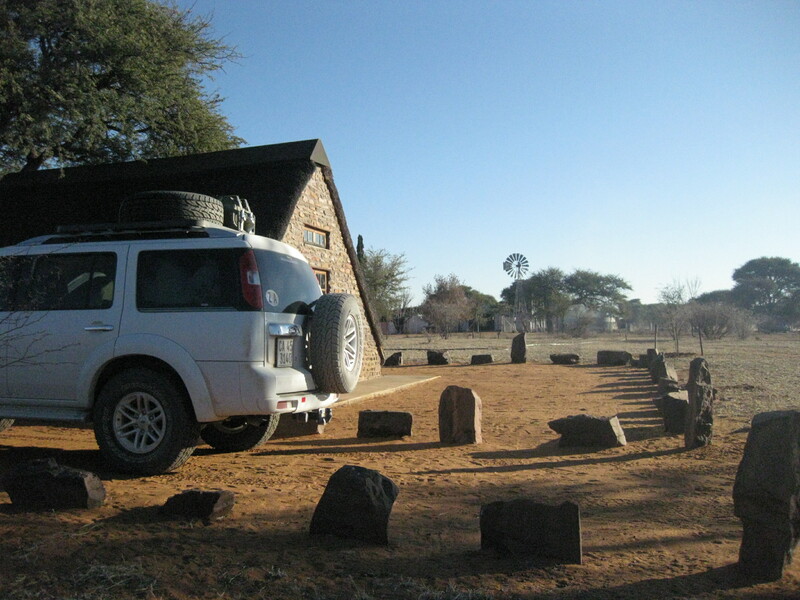 She waved as we drove out the front gate and back onto the white gravel road that lead to the border to Botswana. 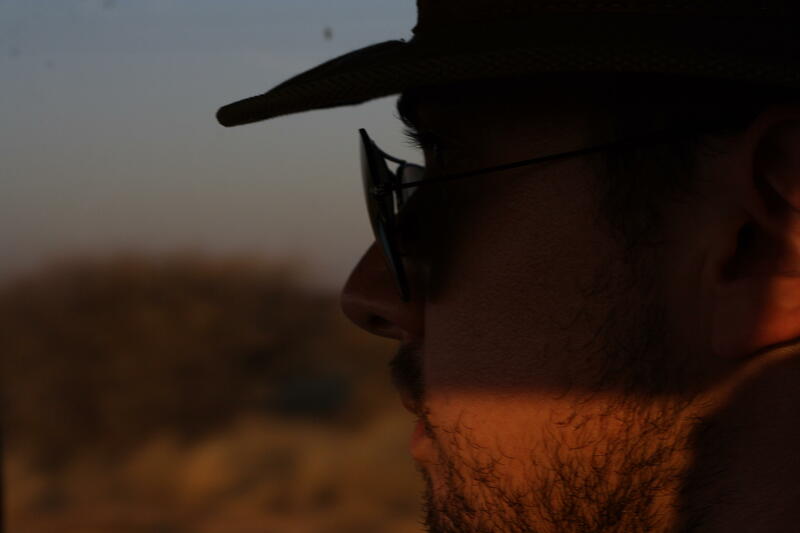 From the farm, the border to Botswana was just an hour or so. And oh my, it was chaotic. The main office was swamped with a sea of people, all locals, frantically filling out immigration forms, shouting, and waving documents in their air. We were the only white people, and we immediately attracted attention. There were two counters, one which was being besieged by the crowd, and another on the other side of the room without a single person at it. Luckily, that empty counter was reserved for non-Namibians. We stamped through the border in record time. Awwwww it looks like an incredible experience!! !